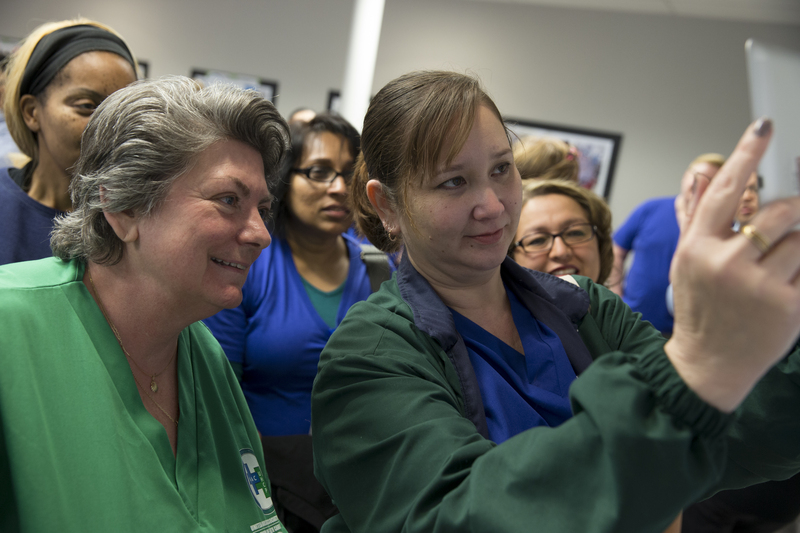 Peering into our future of seamless workplace colllaboration: UNAC/UHCP nurses at a training. UBT members, co-leads, sponsors and all employees can learn more about Labor Management Partnership and unit-based team processes by taking trainings in LMP orientation, consensus decision making, interest-based problem solving and the Rapid Improvement Model. There is also a co-leads workshop for UBT co-leads, and a training in effective sponsorship for UBT sponsors. Learn more about available trainings by consulting the Learning Portal of this website or by contacting your team’s UBT consultant. In addition to offering trainings, every region has consultants who provide support to unit-based teams. Though they go by a variety of titles depending on the region, these consultants can help teams become more proficient, get necessary training and overcome obstacles. Union partnership representatives offer similar guidance. If you’re not sure who your UBT consultant or union partnership representative is, contact your regional LMP co-leads.